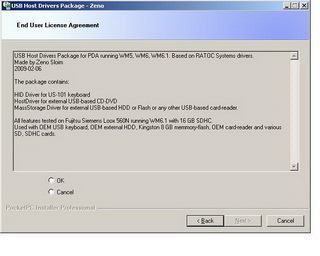 Zeno USB Host Drivers - USB drivers for Windows Mobile. Based on RATOC Systems drivers. All features tested on Fujitsu Siemens Pocket Loox 560N running WM6.1 with Transcend 16 GB SDHC Class 6. Download and run installer.exe on your pc, autorun-ppc.exe on your pda, autorun-sp.exe on your smartphone. - USB-to-Serial Port driver (start Terminal in Start-Programs for configuration). - RS232 USB Serial Driver (start RS232 USB Serial Driver in Start-Programs for configuration). - PTPView for HOST & PTP Digital Cameras driver (non-USB Mass Storage such as Sony, Canon etc. ).